St. Stephen’s Basilica (Hungarian: Szent István-bazilika) is a Roman Catholic basilica in Budapest, Hungary. It is considered the most important church building in Hungary. The church is named in honor of Stephen, the first King of Hungary (c 975–1038), whose mummified hand is housed in the reliquary. Equal with the Hungarian Parliament Building, it is the one of the two tallest buildings in Budapest at 96 metres (315 ft). Current regulations prohibit any taller buildings in Budapest. It was completed in 1905 after 54 years of construction. During construction, the dome collapsed in 1868 which required complete demolition of the completed works and rebuilding from the ground up. The architectural style is Neo-Rennaissance; it has a Greek cross ground plan. The façade is anchored by two large bell towers. In the southern tower is Hungary’s biggest bell, weighing over 9 tons. 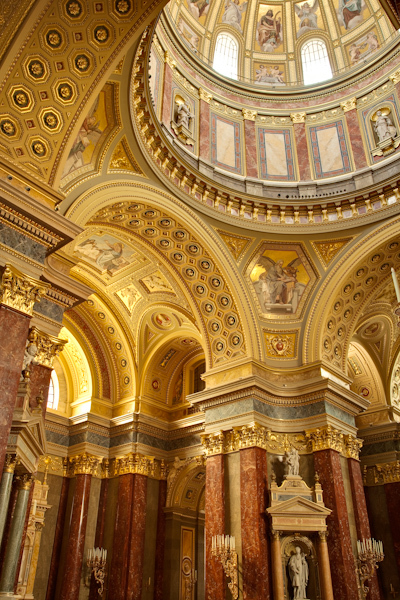 St. Stephen’s Basilica is a lovely church and one of the top tourist destinations in Budapest. I was able to complete all my photography, while being ignored by the clergy. Then on the way out the door, a priest approached me and pointing to the tripod said, “not allowed.” I said “OK” as I was all done. I do not know why so many people are against tripods. I was careful to keep out of everyones way and my rubber tips certainly do not harm the floor. I think rules are created because of some problem years ago with one photographer, and the rules just get passed on down without any reasoning or understanding. The whole anti-tripod thing sure gets old. The very next day, I was prevented from photographing in the subway system because of the tripod. This was surprising as I’d been photographing for weeks in the system and been observed and ignored by countless metro employees. I just takes one guy who feels he has to exercise his authority over others to really ruin a photographer’s day. This entry was posted in Hungary, Travel.